Dental bridges are made from a durable porcelain material and designed to replace the gap left by a single tooth or multiple adjacent missing teeth. In addition to cosmetic concerns, the space created by missing teeth can cause more serious issues to develop when left untreated, such as bite problems and an increased risk of gum disease. By replacing the missing tooth or teeth with a dental bridge, you can preserve the beauty of your smile while protecting your oral health and function. Ballston Lake cosmetic dentist Colin Morton, DDS is highly skilled and experienced in replacing missing teeth with dental bridges for an exceptionally natural-looking smile restoration. To learn more about this popular treatment, please browse through the content provided below or contact our office today to schedule an appointment with Dr. Morton. 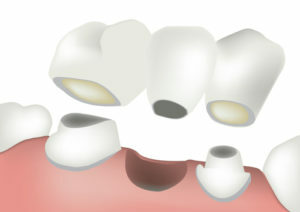 A dental bridge is typically held in place by two porcelain crowns. These crowns are attached to the natural teeth on either side of the missing tooth to maximize support for the restoration. Conversely, dental implants are the small titanium posts used to anchor a tooth restoration in the jawbone, similar to a natural tooth root. In some cases, dental bridges can be secured to dental implants to replace multiple adjacent teeth for an incredibly durable and long-lasting solution. From a cosmetic perspective, dental bridges can rejuvenate the appearance of the smile with beautiful, natural-looking results. However, the oral health benefits of replacing missing teeth with a dental bridge can be just as significant. When a gap is left in the smile, the surrounding teeth are more prone to shift, causing additional gaps or misalignment. In addition, the overall strength of the bite can become compromised, difficulties eating or speaking may develop, and the risk of gum disease might also increase. Over time, the bone structure of the face could even begin to shift, permanently altering one’s facial aesthetic. Dental bridges offer a missing tooth solution that can help prevent these developments while improving the appearance of one’s smile. As an added benefit, dental bridges may be an ideal solution for patients who are not good candidates for dental implants. Traditional Bridges – With traditional dental bridges, the teeth on either side of the gap left by a missing tooth are fitted with dental crowns that hold the bridge securely in place. Implant Bridges – Implant bridges are like traditional bridges in that they are supported by crowns on either side of the tooth gap, but instead of capping natural teeth, the crowns are anchored firmly in place with dental implants. Cantilever Bridges – As opposed to being attached to crowns covering natural teeth on either side of a missing tooth, cantilever bridges are affixed to a crown on just one side of the gap. Maryland Bridges – With Maryland dental bridges, the replacement tooth is held in place with a metal or porcelain framework bonded to the back of both adjacent natural teeth. Due to their excellent stability, durability, and natural-looking and -functioning results, Dr. Morton most commonly uses traditional dental bridges and implant bridges at our practice. The best option for you can be discussed at the time of your appointment. During the consultation process, Dr. Morton will perform an oral exam, discuss your goals, and help you make an educated decision about which restoration method is best suited for your needs. If together you decide a dental bridge is the most appropriate treatment option, a customized plan will be formulated, and a date for treatment can be set. The actual dental bridge procedure is usually completed in two separate visits. During the first appointment, Dr. Morton will carefully prepare the teeth on either side of the gap, and an impression of the area will be taken to ensure a proper fit for the dental bridge and joined crowns. To make the tooth preparation process as comfortable as possible, Dr. Morton will typically numb the area and/or utilize sedation dentistry, if needed/desired. Once the dental bridge has been custom-designed and constructed based on the impression, you will be asked to return to our office so Dr. Morton can secure your new restoration in place. The final result is a new tooth (or teeth) that looks, feels, and functions just like your natural teeth. With patient comfort being a top priority, Dr. Morton does everything in his power to ensure any potential discomfort throughout the dental bridge process is minimized—if not entirely eliminated. As mentioned above, he can employ numbing agents and sedation techniques (e.g. laughing gas) as adjacent teeth are prepared to help ensure no pain is experienced. In addition, our practice provides warm towels, blankets, and movies during treatment to further increase comfort. In the end, most dental bridge patients say they felt little to no discomfort at all. While there is no one set price for dental bridges, factors that contribute to the overall cost of the procedure can include the number of missing teeth, the location of the restoration, and whether or not dental implants are involved. Following an evaluation at our practice, Dr. Morton can provide an accurate quote for the cost of your dental bridge(s) based on your unique needs and goals. If financial aid is desired, our office offers several dental financing options with low monthly payments and minimal interest rates that can help make treatment an affordable reality. When properly cared for, dental bridges can last decades. Patients with dental bridges should continue to brush and clean the teeth as usual. In addition, twice-yearly oral exams can help ensure that your bridge continues to function optimally. During the consultation process, Dr. Morton can give detailed instructions for how to best care for your dental bridge. Can Dental Bridges Be Replaced? When a dental bridge has reached the end of its lifespan—be it from damage, general wear, or another issue—it can usually be easily replaced. If the abutment teeth on either side of the gap are still healthy, Dr. Morton can craft a new bridge that fits securely in place for a natural look and ideal function. When the abutment teeth are showing signs of decay, however, he may first have to restore optimal oral health before replacing the bridge. In the event these teeth cannot be restored, Dr. Morton might suggest their removal and replacement with an implant bridge. If you would like to learn more about dental bridges, or to schedule an appointment at our practice, please contact us today.